Lizabeth Madal spent her early years living along the Eastern Seaboard. She relocated to Southern California and earned a Master of Arts Degree, with Honors from California State University, North-ridge. She later attended the Academy of Art College in San Francisco and began painting with oils, transferring the beauty of the California landscape to canvas. In 2002, Lizabeth moved to Santa Barbara where she converted an old barn on her property to a studio and art gallery. The beauty of California’s Central Coast provides inspiration for many of her paintings. 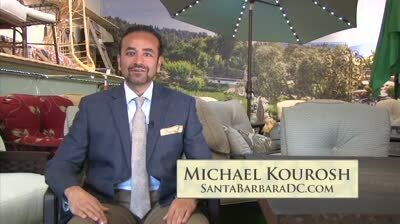 “When I design a vignette to showcase our furnishings here at the Santa Barbara Design Center, I want it to be both functional and pleasing to the eye. I usually start with the rug to give a good foundation to the furnishing and provide inspiration for the style and colors that will go into the space. Whether its a living or dining room, office or bedroom or even a outdoor patio area, I focus on the best lay out of the major furnishings like the sofa or dining table, then arrange the supporting pieces, such as the coffee table or side tables or chairs. The pieces should work together to create comfort and convenience. Her beautiful murals can be seen at the Santa Barbara Design Center in Santa Barbara, California and Mediterranee Antiques and Art in Carpinteria, California.